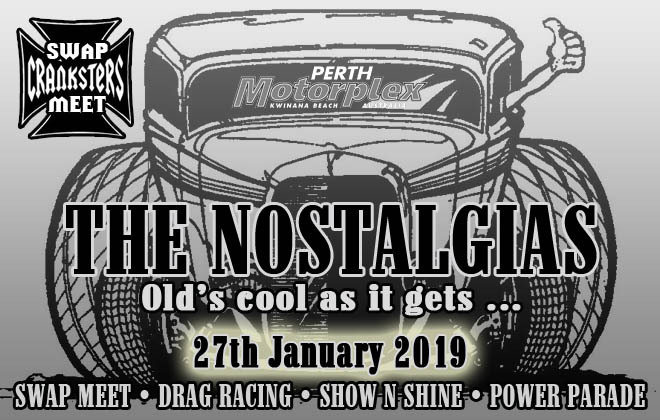 The Sunday of the Australia Day Long weekend at Perth Motorplex the Nostalgias will celebrate everything old school and retro automotive. Bring the family and take in all that the Nostalgias has to offer. With the Cranksters automotive Swap Meet, the Show an Shine in the pit area, the Cruising and of course Drag Racing on the quarter mile there will be plenty of fun for all. After celebrating Australia Day come on down to Perth Motorplex on Sunday the 27th January for a fun day of Old School Drag Racing action! All the usual activities will be happening including Cranksters Swap Meet, Drag Racing, Show n Shine and Power Parade will be scheduled at this event. The Cranksters automotive Swap Meet will get you started, with Sellers admitted from 7:00am and Buyers from 7:30am … you never know what you might find available. Rare parts, performance upgrades, memorabilia – it’s the ultimate treasure hunt. The Show and Shine in the pits means if you have a classic street machine or hot rod, you not only get a prime parking bay but the driver will also get $5 off the normal spectator entry. Come and be a part of the atmosphere and display your pride and joy under the Kwinana Beach sun. Judging takes place and you might just come away with a cool trophy. Being in the Show and Shine means you can also take part in the Power Parade at 1.30pm (approx. ), where you get to cruise up the drag strip and return road in front of the crowd with your family and friends. Drag racing gets going from 10am and with a bunch of brackets, there is bound to be somewhere for you to smoke it up and hit the quarter mile or just have some fun! All Racing will be Chicago Shootout, this means win lose or draw you come back for the next round! The two cars with the most wins will contest the Final!